What to Watch-Kids | Curioser and Curioser! Test drive: I watched it twice, which is rare for me. 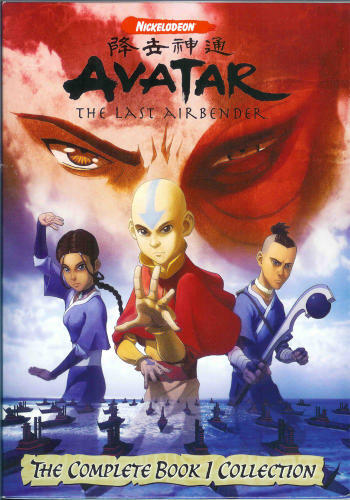 It became a favorite of my 11-year old boy, who eventually got the soundtrack, which he now uses to torture his sister. This movie is deceiving. 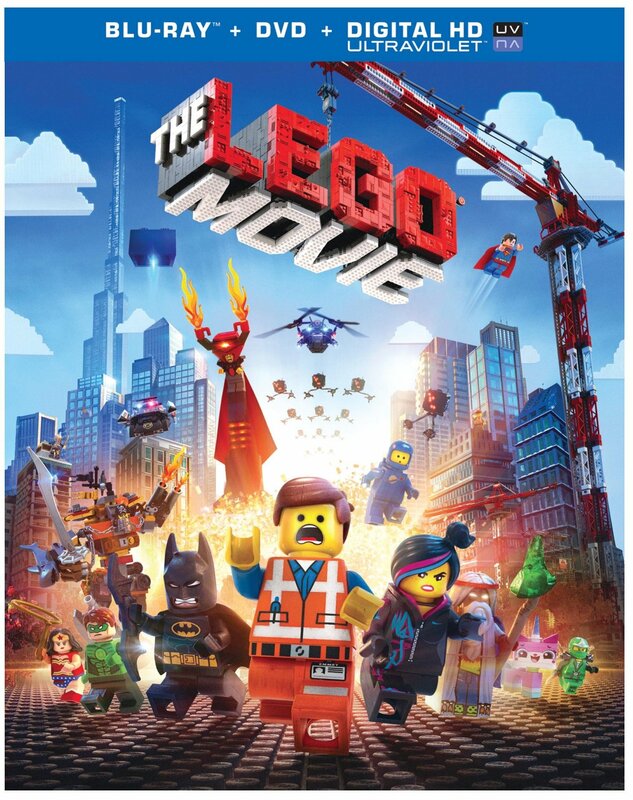 It looks for most of its run as a pastiche, devised to sell sets from all LEGO collections while making better-than-average jokes about action-movie cliches. The adventure, set in a variety of LEGO worlds, is done with enormous talent, cleverness and attention to detail. It’s enough to make every kid (and a fair share of the grownups) laugh from beginning to end, with some wows! here and there. But there is more to it than that. An unexpected, fantastic twist makes all the apparently chaotic silliness suddenly make perfect sense. That’s all I want to say about it, else I’ll ruin it (“You’ve got to trust me on this one.”) If, like me, you are looking for wonder in all places, you won’t want to miss it. Test drive: Takes a while to pick up speed, so your kids will need to be patient with it. Once you get to the fantastic Animal Soccer scene, however, it’s more than worth the wait! As a child, one of the most popular Super-8 shorts they’d show at birthday parties was the Jungle Soccer Match, in which the various animals in both teams displayed their abilities while running over and over the unlucky human designated to referee. It was a short masterpiece of animation, that brilliantly incorporated some live-action actors (including the unfortunate ref.) We’d never get tired of it! 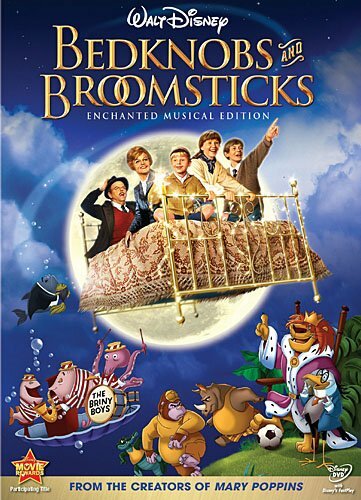 So imagine my surprise when I discovered, on a rerun of Bedknobs and Broomsticks, that there was a High Adventure context to this little story! The human characters, guided by a benevolent but inexperienced witch (Angela Lansbury) are trying to save Great Britain from an upcoming German invasion. To do so, they must travel to magical places in order to recover an artifact that will let them conjure the spirits of old warriors to come in their aid. The movie is not the timeless masterpiece that Mary Poppins is: it takes a while to pick up the pace, and even then still moves slowly for present day standards. But if you and your children can withstand the slow buildup, you’ll be rewarded with such classic scenes as “Portobello Road” (now I can’t eat a portobello sandwich without humming it! ), dancing under the sea, Germans vs. Knights, and of course, the inimitable Jungle Soccer Match. And beyond the individual scenes, the movie still inspires, better than many more recent ones, the feeling that-below the surface, yet not too deep-magical things could happen at any time. Test drive: My 9-year-old boy loved it. I have to say: The 1956 version of Jules Verne’s classic bored me to death when I was a kid, and the 1989 miniseries with Pierce Brosnan had only one joke worth remembering. 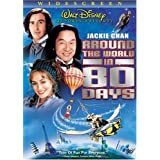 Phileas Fogg’s classic wager is here made more pressing by a dangerous plot from some evil Chinese faction (the reason why he is joined by Chan’s Passepartout), and his love interest takes the shape of a French artist; so the licenses are obvious. But Jackie Chan’s physical comedy finds a great complement in the understated, self-deprecating humor of his eccentric employer, and we are treated by cameos from John Cleese, Luke and Owen Wilson, Sammo Hung (as the legendary hero Wong Fei Hung) and yes, the Gobernator. All in good fun, nothing inappropriate. A few good laughs, but mostly a very happy movie, from beginning to end. Test drive: Another family hit! “Very good and clever,” according to my 10-year-older. A few of the special effects haven’t aged that well; but the fire tracks the DeLorean leaves on the pavement still look super cool! The mid-eighties saw many protegees of Spielberg make a great number of truly creative, truly entertaining adventures, always with some element of the fantastic or sci-fi in them (much more fun as a rule than the gloomy adventures of the 2010s). Of these, Back to the Future is one of the most accomplished, and possibly the best time-travel movie ever made. Definitely something that you should share with your children! 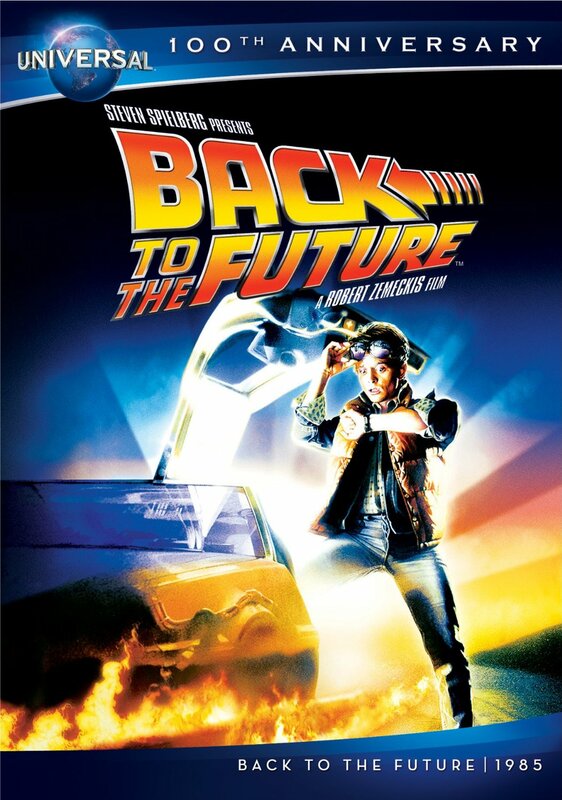 You should know this; but in case you don’t (spoiler alert), the movie follows the story of Marty McFly (Michael J. Fox, in one of his most famous roles), the teenage son of underachieving parents, as he travels back in time to the 1950s, and accidentally causes his future mom to get a crush on him, which will in turn cause him to disappear from existence. So now he has to make his parents fall in love with each other, while fighting school bullies, finding a way to repair the time machine, and avoiding any further history mess-ups. On the way we are treated with buckets of out-of-time jokes, cool skateboard-action scenes, and a mounting tension, as at every turn of the road things gets increasingly difficult for Marty. Nearly 30 years later, my kids still picked most of the humor, with the exception perhaps of some jokes based on political figures and celebrities (“Ronald Reagan is president?”) They found some of the effects “cheesy,” and the beginning felt a little slow. But soon they were caught in the mounting difficulties of Marty, and fell in love with the irresistible Doc, the eccentric, always intense inventor that envisions the ’80s like a Buck Rogers comic. In short, the movie was a Blast from the Past. Test drive: My daughter played it over and over. My son watched it a few times. Grownups: This is an exception to my “watch with your kids” selection, the reasons explained below. It’s easy on the ears the first five times, and may be eyed occasionally from the safety of the next room. Please hear me out (before you preemptively unfollow me)! None of those movies, however, would make it into this list as something that grownups can enjoy together with their children. Unless, of course, you are the kind of grownup that enjoys being hit on the head repeatedly with a pink bat sprinkled with powdered sugar. To their merit, the music is not terrible. Worse perhaps, the voices are well cast, and the songs are awfully catchy. By comparison, the “message” of this movie is surprisingly mature! The girls must listen to their calling. It may not be what they originally wanted, but it may be bigger than them, so they must adapt, and sometimes accept it, and make the best of it. Oh, and marrying a handsome guy will not be the solution to all your problems: concentrate on finding yourself first, and your place in the world. Really. Don’t you wish the Disney executives had taken a page from them? Bottom line, you will probably not want to sit through this one—I never could—but it’s worth eyeing it every now and then from the safety of a corner. 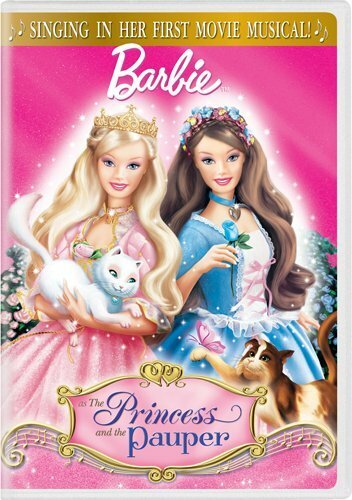 After P&P, Barbie did one more of those (The 12 Dancing Princesses), and then dropped the formula. They exchanged their computers for even older computers, by the looks of it, and began turning in some fairytopia and mermaidia stories that are even worse than they sound. By then, thankfully, my daughter was critical enough to realize that there were other things out there worth her time.